The Waste Management Phoenix Open started today. It was a beautiful day in Scottsdale. Yes, the Phoenix Open is in Scottsdale at the TPC Scottsdale Golf Course. The Thunderbirds, sponsors of the open, always put on a great show. It was good to see 2-time Champ and Arizona State University Alumnus, Phil Mickelson out there. Phil was playing with Ryan Palmer today. Ryan is the grandson of Arnold Palmer. Ryan was playing some impressive golf. Also, it was great seeing Freddie Couples playing well. He will be a real draw on the Champions Tour (Seniors) this year. Freddie’s smooth swing is always a pleasure to watch. 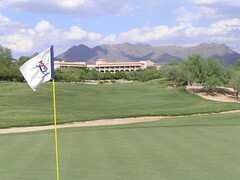 Visit the TPC on your next Scottsdale Vacation.